Internet forums and chatrooms can have positive effects that should be more widely acknowledged, experts say. The call comes after Oxford University researchers carried out an analysis of 14 different studies looking at how young people use the internet. The review - published in the Plos One journal - said a number of studies had found a link between internet use and self-harm and suicide. But it said others had found the internet could be a positive influence. The dangers of internet use have received widespread coverage this year. In one case, in August, 14-year-old Hannah Smith from Leicestershire was found hanged after she had been sent abusive messages on a social networking site. 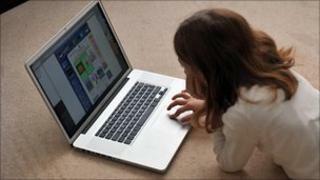 Since then research by the NSPCC has suggested a fifth of 11 to 16-year-olds have had negative experiences using the internet. The Oxford University research highlighted a number of dangers from internet use, including the normalising of self-harm and the risk of bullying. It also said there was a "strong link" between internet forums and an increased risk of suicide in particular. But the researchers said some studies had shown that internet forums could support and connect socially isolated people. There were also examples where forum users encouraged positive behaviour, advised others to seek help and congratulated each other for not harming themselves. Report author Prof Keith Hawton said: "Communication via the internet and other electronic means has potential roles in both contributing to and preventing suicidal behaviour in young people. "The next step is going to be development of therapeutic interventions using these channels of communication, especially to access those who do not seek help from clinical services." Joe Ferns of the Samaritans added: "We should acknowledge that many people are using suicide forums and chatrooms to anonymously discuss their feelings of distress and despair, including suicidal thoughts, which may have a positive impact on the individual. They may be expressing feelings that they have never disclosed to anyone in their offline lives. "Rather than concentrating primarily on ways of blocking and censoring such sites, we should think about online opportunities to reach out to people in emotional distress."